In Gamestar Mechanic, a number of square power-up items are available in Addison’s Complete Quest, granting the avatar improved abilities when it touches and automatically picks up the item. All active power-ups, including keys, are displayed in the upper left corner of the game screen. The armor pack gives the player armor, allowing it to take more damage. The red beam in the health meter turns white and is covered by a large, white number denoting armor points. Your avatar cannot lose health until its armor is depleted. Armor isn’t accumulative: If you have X points of armor and you pick up an armor pack worth Y points of armor, your armor becomes whichever of X and Y is greater. This makes armor helpful, but no substitute for health. A more indirect item, the backpack sprite lets you see a tooltip the first time you collect this sprite on a level. When you have a backpack, you don’t use any items you collect (except keys). Instead, they’re stored in an inventory that’s accessible with the inventory key (I), which lets you click on items to use them. Using the backpack, your players can use health packs only when needed and save power-ups for the right moments. The blaster is an obtainable weapon that causes the avatar to glow with a red aura, allowing even defenseless avatars to fire bullets at an extremely fast rate. This item can last indefinitely, or it can burn out after 10 to 40 seconds, depending on how you structure your game. You can also apply a blaster to an avatar that can already shoot, which can be advantageous to avatars with low fire rates. If you give a blaster to an avatar that doesn’t normally use one, the power-up can be overridden by the similar freeze blaster. Effective only in platformer games, the double jump boots allow the avatar to jump twice before hitting the ground. While in midair, the avatar gets an extra jump. This jump isn’t as strong as the first one, but it allows for better maneuverability. For maximized jump height, don’t jump twice in quick succession — wait until the peak of your first jump before launching the second. 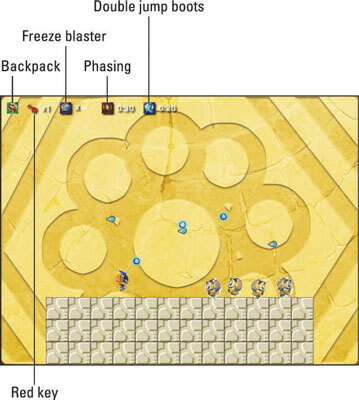 The freeze blaster power-up grants the avatar a freeze blaster (a weapon similar to the blaster), which fires bullets that encase their targets in ice. You can use frozen targets as walls or platforms, but they unfreeze from 2 to 10 seconds later, depending on the blaster’s Freeze Duration setting. If you freeze a frozen sprite, the ice around it thickens, and the timer counting down to the enemy’s release resets. If you freeze a sprite that’s overlapping with other sprites, the unfrozen sprites are fragged instantly. In a platformer game, you can freeze an enemy in midair so that it falls and squashes other enemies. The freeze blaster is a built-in feature of the Altair iceman, Altair freezer, frost wizard, and frost mage, as well as some enemies. However, like the blaster, the freeze blaster increases the fire rate of the default freeze blaster, and an avatar with both blasters can fire with alternating attacks. Frozen sprites are unaffected by collisions, but they can still be damaged by weapons. However, a frozen avatar is unaffected by freeze blasts, whereas frozen enemies are affected. A property of all Karakuri avatars except Naja, phasing lets you share the phasing ability with other avatars. While this item is active, the Action button causes your avatar to freeze in place and become invisible. Nothing can harm you while you’re phasing. Shield-bearing sprites can still deflect enemies while phasing.